The German National Anthem rang out in Germany’s capital city as Christian Ahlmann (GER) and Ailina took a breathtaking home win in the final CSI5* class of the Longines Global Champions Tour of Berlin weekend, clinching the victory from Marcus Ehning (GER). 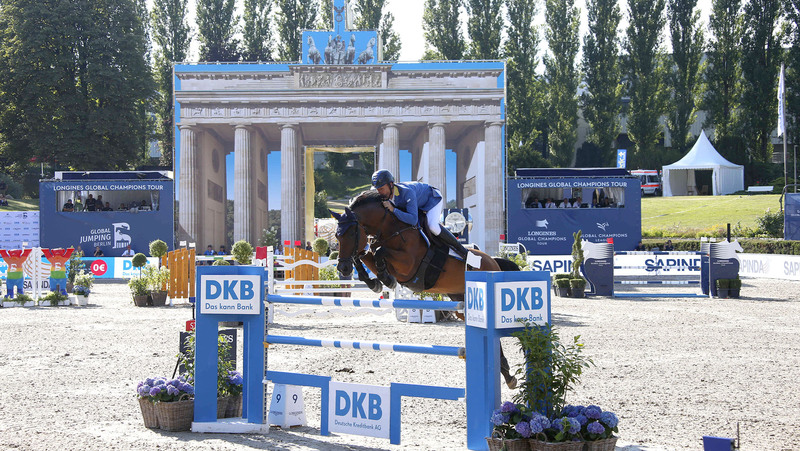 Ahlmann won the very same Championat der Deutschen Kreditbank AG von Berlin trophy at the debut event in 2017, and kept spectators on the edge of their seats today to beat Ehning by just three tenths of a second in a high-ocatne jump-off. Third went to Martin Fuchs (SUI) with Chica B Z, the pair putting in an impressive performance today. Frank Rotherberger created another masterful course for the last competition of the weekend, with the time allowed the most crucial element in story of winners and losers today. 71 seconds was given to tackle the 13 obstacles, meaning there was no let up and put pressure on the combinations to face the course head on, causing faults all over the field. The triple proved to be no problem, despite a wavy happy rail in the middle, and most cleared the wide DKB blue oxer, Longines oxer and Sapinda vertical with little trouble. However a black and blue double off an almost blind corner fell time and time again, as did the final fence as riders rushed to make it home clear within the time. As blue skies provided the backdrop to Sunday’s showdown, fans packed the grandstands and sat in every inch of shade to watch the world’s best take centre stage. The air conditioned stables and warm up area allowed the horses to keep cool, ensuring they were fresh and ready for the competition to come. First to go Daniel Bluman (ISR) with Bacara d’Archonfosse was also the first to go clear, paving the way for the international field of 41 contenders. The duo made it looks simple, however the course showed itself to be anything but, as poles fell at all points of the uniquely shaped oval arena and clears were few and far between. The crowd groaned as home hero Daniel Deusser (GER) picked up a single time fault - heartbreaking after the popular German rider put in a beautifully rhythmic clear round with the 11 year old Cassini Bay. Others too would fall foul of the time, including big names such as Peder Fredricson (SWE) with Hansson WL, and Yuri Mansur (BRA) with Opium du Soufflet CH. David Will (GER) with Quibelle soon lifted local spectators' hopes again, with a foot-perfect clear to finish a second and a half inside the time and create a jump-off. If there had been a roof it would have been lifted as Ludger Beerbaum (GER) with Cool Down gave the crowd exactly what they wanted with a masterclass clear, timing his round to perfection to finish one third of a second inside the time allowed. A man on flying form, Marcus Ehning (GER) also pulled out a spectacular clear with the small but mighty Comme il Faut, blasting away the time to finish in 65.47s and earn a place in the jump-off. Following his round Marcus said: “For me [the time allowed] was fine, and it’s a good course for the last day. [Comme il Faut] is such an amazing horse, if I don’t do something wrong he’s always clear - it’s always fun to ride him. We’ll have a nice jump-off,” he predicted. He would be joined by Rolf-Göran Bengtsson (SWE) with Crunch 3, Niels Bruynseels (BEL) with Delux van T & L, last year’s winner Christian Ahlmann (GER) with Ailina, Emanuele Gaudiano (ITA) with Caspar 232, Martin Fuchs (SUI) with Chica B Z and Denis Lynch (IRL) with The Sinner. First to return to the ring Daniel Bluman (ISR) and Bacara d’Archonfosse applied the pressure, jumping clear and setting the time to match in 34.42s. It started to unravel for David Will (GER) after he clipped the Sapinda vertical and misjudged the turn back to the wavy plank with Quibelle to collect eight faults and rule themselves out of contention. The arena fell silent as multiple Olympian Ludger Beerbaum (GER) entered with Cool Down. The pair opted for a steadier pace, but looked close until the final fence which fell in their attempt to do eight strides to the last. Marcus Ehning (GER) set off at a gallop with Comme il Faut, the little stallion pricking his ears in anticipation as he flew towards the fences. Turning on a pinpoint, and flicking his tail as he cleared every fence, the duo shaved milliseconds off the time, flying towards the last to stop the clock in 33.88s, taking over the lead to a roar of appreciation from the crowd. Rolf-Göran Bengtsson (SWE) rode Crunch 3 brilliantly around the shortened jump-off course, but the large striding horse just couldn’t match Comme il Faut’s speed across the ground. It was a valiant try, but the pair could only slip behind, finishing in 35.81s. A pole for Niels Bruynseels (BEL) with Delux van T & L also dropped them down the order with four riders left to challenge Ehning’s time. Home hero Christian Ahlmann (GER) won this class in 2017, and set off at a pace with Ailina jumping every fence at an angle and taking a bowing line to the final fence. The crowd were on the edge of their seats as the pair just pipped Ehning’s time, finishing in 33.58s and taking over the lead. A pole for speed merchant Emanuele Gaudiano (ITA) and Caspar put the dangerous combination out of contention, leaving just two in between Ahlmann and a home victory. Martin Fuchs (SUI) and Chica B Z gave everything, knifing across the Sapinda vertical and taking the same line to Ahlmann to the finish, but couldn’t quite match the German’s time, finishing in 34.08s. Final rider to go Denis Lynch (IRL) with The Sinner knew that he couldn’t better their time, opting for a smooth clear to finish in 38s, meaning that Christian Ahlmann (GER) would finish victorious again today. The LGCT now looks to London and the Royal Hospital Chelsea for the 13th leg of the Championship, from 3rd - 5th August.